2. Check your email for link to confirm creation of new account. 3. After confirming, sign in to your new account. 4. Now that you are logged in, you will see a page like the one below. Once you do, click on "Forms". 5. 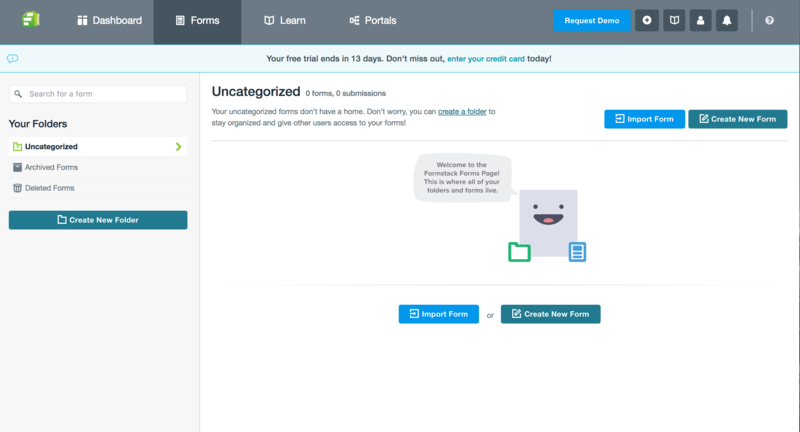 You will be taken to a new page where you can create forms. 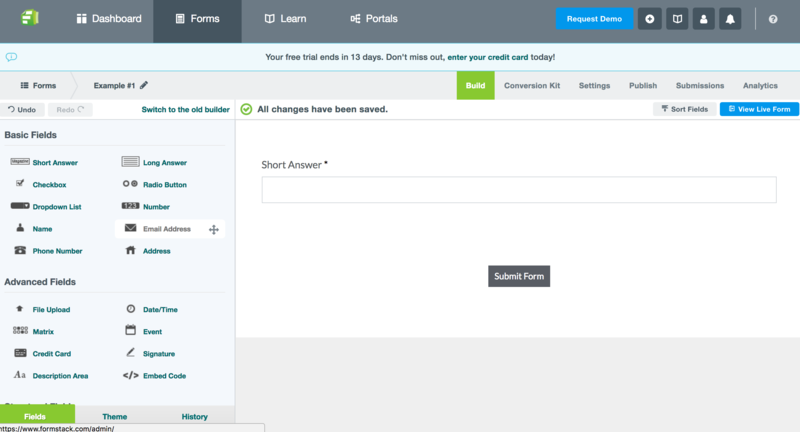 To create a form, click "Create New Form". 6. Next, you will have the opportunity to name your form, and decide if you would like to start with an empty form or a template. We named our form "Example #1", and chose a blank form. 8. Once you have done so, click on your "Short Answer" field on the right side of the screen. This will allow you to edit the field. For now just change the name to "Carrier Name". Once you have finished editing, click "Close" on the left side of the screen. 9. Now let's add another field. 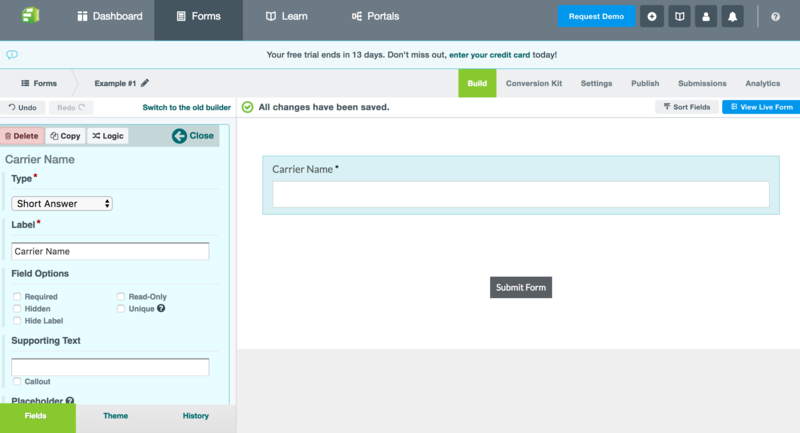 Drag and drop the "Number" box on the left side to where the "Carrier Name" field is. Click on the "Number" field now that it is on the right side of the screen. Change the name to "Premium Annual". If you move your mouse cursor to the left side of the screen where it says "Label", and then scroll down, more options will appear. As you do so you will notice where it says "decimal places". Change this number from "0" to "2". Once these changes have been made, click "Close" on the left side of the screen. 10. Now that you've finished these first two fields, feel free to add more fields from the chart below as desired. Keep in mind that the type and name of field are extremely important. 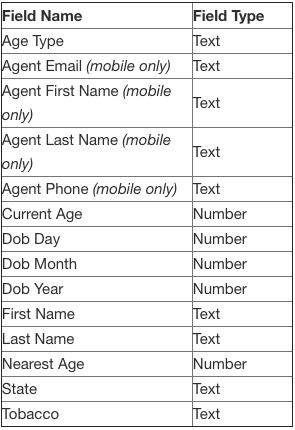 The chart below includes the field names and types that must be used. The spelling and capitalization must be the exactly the same for each name. 11. You've created your first form! Next, click on the "Publish". You should now see a URL. Click the "COPY" button next to it. 13. Enter your email and password, then click "Login." 15. Find your Agency Life Quoter, Mobile App, or Website Quoter in your list of products. Click on the name. 18. 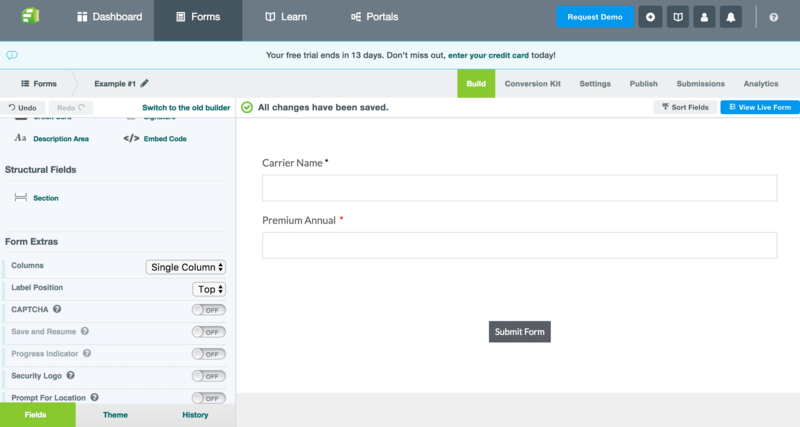 You will now see a page where you can upload an "Icon", change the "Type", "Label", "URL", and limit/include Carriers. For this guide, we will only change the type, label, and URL. 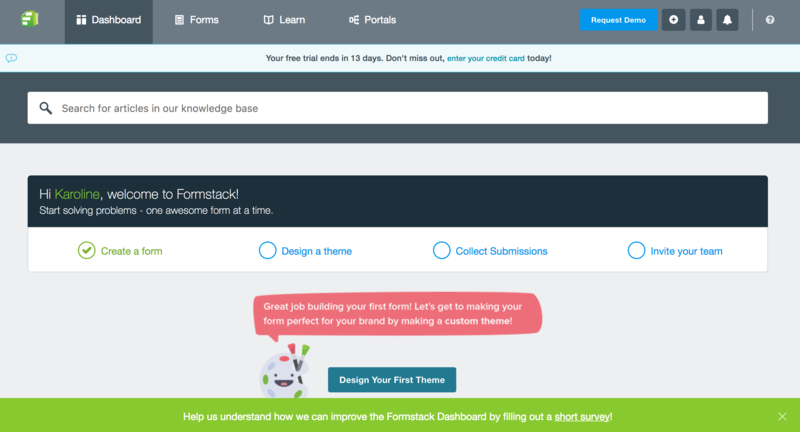 First, change the type to "FormStack Form". 19. Next, name your label! We will name this label "Formstack". 20. 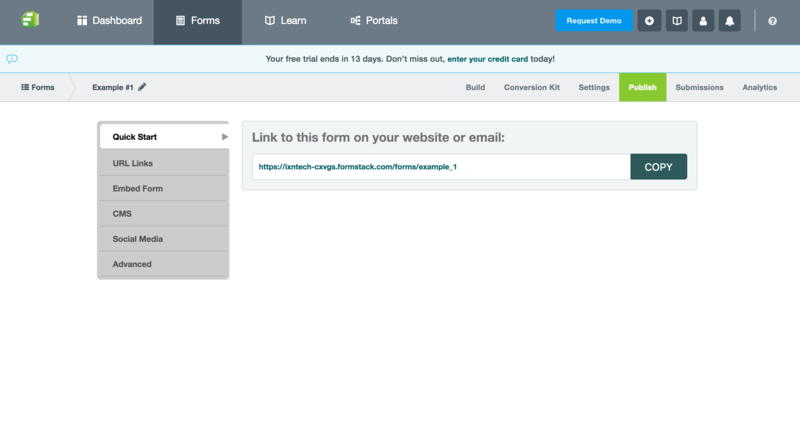 Now, we will enter the URL we copied from FormStack after creating our form (see #10 for reference). We will paste this URL into this field. 21. Click Save in the right hand corner. 22. You've created an action! 23. Next, go to your product to run quotes. For this example, I've entered generic information. You may input whatever information you like. 24. Click "View Quotes" to see your results! Once you've done this, there should be quotes listed for your selecting. Click on a quote. I selected the first quote available, and I see that my action is there! It will be whatever you named it. Mine is "Formstack". 25. Click on your action, or in my case "Formstack". 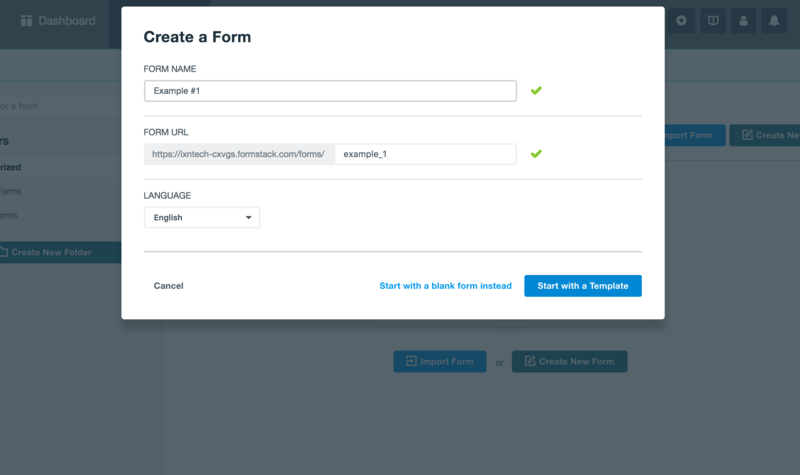 You will now be redirected, and will see the form you created in FormStack! You will also notice, that the fields have been pre-filled with information provided in the quote. Click "Submit Form" to submit. As a closing thought, I want to remind you that the spelling and capitalization of field names is very important. If they are spelled correctly, the fields in your form will be pre-filled when you click on your action. Otherwise, it will not work. That's the end of our guide. Thank you for following along!